Iron ore giant Vale has done it again. It has caused the rupture of yet another dam in Brazil, hurtling sludge into a rural valley in Minas Gerais state, killing 60 people so far. Some 300 are still missing. And joining me now to discuss the disaster is Michael Fox. Mike is a freelance journalist living in Florianopolis, Brazil. Thanks so much for joining us, Mike. MIKE FOX: Thanks for having me. SHARMINI PERIES: Mike, tell me exactly what happened, and of course about the company Vale that is now responsible for two such disasters. MIKE FOX: So, on Friday afternoon there was a break in the dam, the tailings dam, in their iron ore production. This was a dam that had held this reservoir that had been unused for the last three years, but it was holding roughly 12 million cubic meters of sludge. It broke. It cruised down the hill and went into a valley, literally knocking out much of the valley complex there. It hit a lunchroom, where at least 100 workers were there lunching. We know that it knocked out several buses, because they found some of those remains, covered up [inaudible], a hostel, and some parts of other communities. So, obviously rescue workers went into effect. That was on Friday afternoon, and they’ve been searching for people ever since. Vale is the largest mining company in Brazil. It used to be state owned. It was privatized the 1990s. It’s the second largest mining company in the world. And they have many operations here in Minas Gerais. This is just a devastating, devastating thing to happen. Like you said, just three years after the Mariana disaster. The Mariana disaster was the largest environmental catastrophe in the history of Brazil. This one is looking–it might be less so, but in terms of the death count it already has three times more dead than the disaster that happened three years ago. SHARMINI PERIES: Mike, now, Bolsonaro, the newly elected president of Brazil was quick to distance himself from what had just happened, in terms of the rupture of the mine. How responsible is the government for what has happened? MIKE FOX: This is really key, Sharmini. I mean, first off, just to look at what Bolsonaro did say, he said this has nothing to do with the federal government. And that puts into perspective Bolsonaro’s vision for the environment and for his–what he looks to do for his government, his administration, in the coming years. But if you look back just at 2017, according to the latest figures from Brazil’s National Water Association–and that was the latest figures that we have is for 2017, not 2018–only 3 percent of Brazil’s dams, 3 percent, of Brazil’s 24,000 dams were inspected. Now, that is a major issue, and it can show what the flaws are in terms of going forward. In the same year, 2017, only 23 percent of the federal funds budgeted to inspect, monitor, and operate dams were actually spent on that. So the federal government has obviously–it should be definitely held responsible for following up and monitoring these things, making sure that these dams are structurally intact and these things aren’t going to happen again, but also going after the damages and actually holding private companies responsible. And these are two areas that it’s going to be really hard to see how the Bolsonaro government is going to follow through with that. Now, Bolsonaro’s Minister of Institutional Security came out on the day after this happened, and he said, yeah, we need to create new regulation, we need to create new laws, we need to be much stronger to make sure it doesn’t happen again. Now we’re going to find out if this is just lip service, or if they actually mean it. Because like I said, Bolsonaro ran on a platform of weakening environmental relation, of of doing less inspection, and really opening the range to development into corporations to really be able to take care of themselves, and inspect and monitor themselves. So we’re going to see if if Bolsonaro and if his government is actually able to do that. Now, Dodge, the attorney general, has come out and said they really want to hold people responsible. They need to really focus on how we’re going to continue to inspect and monitor, and really up the level of process. But like I said there’s 24,000 dams, and this is just near mining, and these are just dams. We’re not talking about the environmental regulations and the potential environmental damage of every other aspect of industry, whether it’s agribusiness, or anything else in Brazil. So this is going to be an issue that we’re going to see what actually happens. And if we’re looking at what Bolsonaro has said so far, and what is pretty clear, his campaign platform is deregulate as much as possible and get the environment out of the picture. It’s not looking good. SHARMINI PERIES: And, Mike, we cannot ignore that this is also an issue for the workers. Because as insecure workplaces like mines and dams, obviously in this particular case there were so many workers in the way of the sludge. MIKE FOX: Absolutely, Sharmini. The big tragedy here is for Vale’s own workers. We still have 300 disappeared, and most of those are Vale employees. And another tragedy–and I’m so glad you brought it up, Sharmini–is the fact that under the 2017 labor reform, one of the items that was actually included in that, it puts a cap on the amount of compensation workers and their families can receive in the case of tragedies like this. So basically under the new 2017 labor reform, workers and their families can only receive from three minimum salaries, or from three of their own salaries up till 50 salaries. 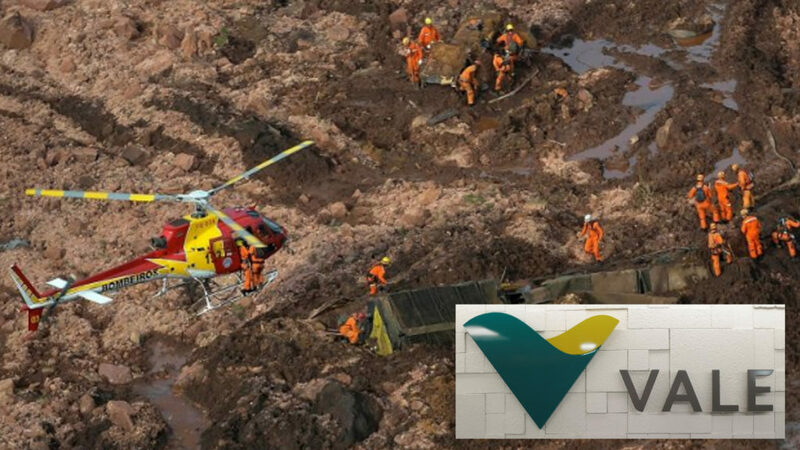 So that means that a Vale worker that was just killed in this massive tragedy may only receive a couple thousand reais. His family may only receive a couple thousand reais in compensation for that. And the limit, the cap on that, would only be would be up to 50 of their own salary. So that–if they were making 1000 reais a month, that would be 50,000 reais as the top that that family could receive. Now, they’re talking about somebody’s lives. Putting a cap on somebody’s lives. And If you look back at Mariana, the people, the families, only received compensation for the Mariana disaster three years later, just this last–very end of 2018. So the families here, A, they’re missing their loved ones, A, they’ve got–they’re facing this massive tragedy in their town, and B, it’s very likely they’re going to be waiting years, if that, to actually receive some form of compensation from the company and from the government. SHARMINI PERIES: All right, Mike, let’s get a grip on how large this company is. It’s not like some small company who is not able to have the resources to manage these dams and mines. I mean, Vale–I know Vale Inco in Canada. They’re so global. That is, I think–you know, in terms of profits and in terms of the stock exchange they’re a company doing rather well. MIKE FOX: Oh, absolutely. Like I said, it’s the second largest mining company the world. So we’re talking huge, billions of dollars in assets. Stocks did fall following this. They fell 20 percent. The government has frozen as much as 11 billion reais worth of funds in Vale’s accounts. That’s roughly $3.5 million–I mean, $3.5 billion. It’s also taken $350 million in fines from Vale. We’re talking about a very, very large company that has operations all around Brazil and all around the world. And like you said, it’s not like they don’t have the ability to follow through with things. So in 2018, last year, there was a private company that came in and did certify that the mine was in good structural–good structural position. MIKE FOX: In good structural standing. But we can see that obviously this has happened again, three years after the other one. And this raises much, much deeper questions about what are the mines themselves doing, those companies doing. So they came out, they said, after the Mariana disaster, the CEO came out and said no more Marianas. We’re going to fix this, we’re going to resolve a bunch of things. And they did implement a couple of features in order to try and make sure this didn’t happen again. One of them was alarm system. We don’t know if that alarm went off or if it just went off with too little amount of time to actually get people out. Regardless, it did not stop this dam from collapsing. And this raises major issues about what the potential could be for other dams around the country, whether it’s Vale or whether it’s tons–there’s 24,000 dams across Brazil, and many of them are from mining companies. Literally just two days ago, on Saturday night, they stopped the rescue mission and they suspended operations in terms of the rescue mission because there were fears that a second dam–this one holding water–in the same complex might itself also break. So they started to pump water from there. Apparently it was raining there. They started pumping water out of the second dam. That lasted from 8:00PM until 4:00AM. They were about to start rescue operations again. And then the emergency signal went off and they had to evacuate as many as 3000 people from low-lying neighborhoods just outside of Brumadinho. So this is the reality. The first dam broke, the second dam they were afraid of. That is now under control, the second dam. Apparently it is not at risk of breaking. But it shouldn’t be–this is not the type of crisis that you need to be living day in and day out, is the dam going to break. This is just–this just should never happen. And that’s what Brazilians are up in arms about. That’s what they’ve been talking about. That’s what the front covers of every newspaper has been talking about. This cannot happen again. SHARMINI PERIES: And, Mike, do we know about the environmental disaster, and of course, what was contained in that sludge? I mean, this is obviously waste from a mine. Has it contaminated the entire valley? MIKE FOX: Oh, absolutely. We know that from the Mariana disaster. Like I said, there was less sludge here, but this whole valley has been contaminated. Animals they’ve already–the animals they’ve been able to save, they’ve had to kill them, because there’s a major issue. And it’ll a major issue for the people living in and around Brumadinho, and also the rescue workers that are here. We’re talking about people that are in the mud beyond the daily, using these big, long, kind of spear-type things, these big staffs, in order to try and get down into the mud, try and see if they can find some sort of a metal structure, a car, people. That’s what they’re using. This is what–it’s actually what they’re calling–you know, it’s day in and day out. It’s very, very slow. And ants work, is what they’ve call it. And so it’s it’s a disaster for the people, and the environmental disaster, it’s huge. Now, to keep us into perspective, this has already hit–some of this mud, the sludge, has already gone into one of the major rivers, which feeds the potable water system, and the water system for Belo Horizonte. Belo Horizonte, which is the capital of Minas Genais, is only about 60 kilometers away from where this complex was. So it’s already hit part of the water system. Now, they’ve been able to isolate that. They say there’s no problem and currently people that are in Belo Horizonte have not been affected from this. But this is definitely–that’s gone into the water, and it’s already killing off massive amounts of fish in some of those major rivers, just outside of Belo Horizonte. So environmentally speaking, it’s, it’s a disaster. Is it as big a catastrophe as Mariana? It is not, because Mariana literally traveled through the river systems and made it all the way from the hills into the Atlantic Ocean, killing parts of the ecosystem along the way. So even bigger for Mariana, but this is still really, really bad. SHARMINI PERIES: All right, Michael. We’ll leave it there for now. Obviously this is a disaster of a size we’ll have to return to and cover the damage that it has left behind. Thank you so much for joining us today. MIKE FOX: Thanks for having me, Sharmini.